Despite the fact that Ski-Doo’s all-new fourth generation REV chassis with its equally all-new 850cc Rotax E-TEC twin will not be the highest horsepower sled on the snow this coming winter, it will be the most influential snowmobile available this season. It is the most important Ski-Doo introduced to date. Yes, the Yamaha 998cc four-stroke turbo lights up the snowpack with an official rating of 180-plus horsepower. While Ski-Doo’s Rotax 850 comes in at 160-165 hp, that’s only part of the story. Virtually everything is new. Ski-Doo’s competition hopes big horsepower numbers will wow you and overlook the fact that those ponies power bolder new graphics. The Rotax 850 powers a new sled that retains key pieces that have been proven to work with an all-new riding platform engineered to handle bumps like no Ski-Doo before it, to turn corners more quickly with intuitive predictability not felt before and with power delivery that is racetrack quick, yet safari-reliable for long club rides. We’re thinking that Ski-Doo probably feels as though its Gen-4 story got lost a bit when Yamaha introduced its turbocharged Sidewinder. Power is what performance snowmobilers want. On the flats there is no denying that power counts. There is no loyalty in the horsepower camps. Out in the steep and deep snows of high altitude snowmobiling, weight is key with strong horsepower coming in second place. 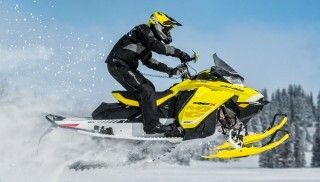 Ski-Doo’s all-new MXZ TNT 850 E-TEC is an excellent replacement for the previous generation TNTs. Designed to function with the 850 E-TEC, the pDrive features friction-free rollers rather than sliders for torque transfer. This results in very quick reaction and 30% less rotational inertia when compared to the previous TRA. The pDrive is claimed to be “so consistent, there is no need for rpm adjustments on the MXZ version.” That was what we were told at the press introduction, but since then we’ve learned that MXZ and Renegade models equipped with the 850 will have clickers for RPM adjustment. Not a big deal to us as clickers were always intended for the Summit 850s anyway. Plus, this simplifies things for manufacturing, assembly and we imagine that performance riders lobbied for the addition. The wind-deflecting windscreen and side panels integrate into the 850’s overall styling for a modern look with a hint of Ski-Doo’s pioneering heritage. We suppose that Ski-Doo’s competition can make a similar case for its engine packages as well. They can’t describe an entirely new – not refreshed – fourth generation of sled riding platform that fundamentally rewrote how we ride sleds. Ski-Doo’s 2003 REV improved snowmobile riding virtually overnight. One day we were all riding with our butts positioned over the rear axle and our legs nearly straight out and the next day our fannies were moved forward to the center of the sled, closer to the handlebar in an upright sitting position where our legs became integral parts of the ride and could absorb bumps along with the suspension. The REV changed everything. HPG plus shocks come standard with the TNT 850’s RAS 3 front suspension and offer 8.7 inches of travel. Ironically, just as Ski-Doo introduced its all-new REV, Yamaha was showcasing its four-stroke RX-1 with the old rearward seating position. The four-stroke changed some things as every other sled maker worked up four-stroke sleds of their own. But the REV had a bigger impact as all sled makers responded to this change. Just as the Indy had done for Polaris, the REV took Ski-Doo to Number One in market share. This fourth generation of REV should help Ski-Doo continue as the market leader. It is to a great extent the reinvention of the REV concept. Ski-Doo engineering worked up the platform and the engine package simultaneously. 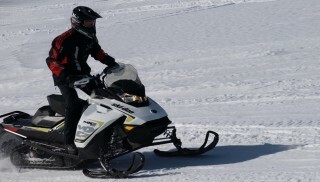 The core idea of the 2003 Ski-Doo REV was to enable riders to have more control of the sled via a new way of riding that centered on rider positioning and centralizing mass. This fourth generation REV started with the expanded knowledge of past REV designs but with the freedom of a totally blank page. Ski-Doo’s engineers were free to create a totally new sled that put rider control and mass centralization as fundamentals in the development process. It also meant, simply, that engineers and sled designers would develop the platform and engine together. To centralize the greatest mass and make the sled more responsive to rider input, the Rotax 850 E-TEC twin was centered laterally in the chassis. The end result is a sled that features 50/50 side-to-side weight distribution, meaning it takes the same effort to turn left as to turn right. That fact was obvious when switching from the TNT 850 to any other REV XS model. Turning into corners and keeping your direction stable is so much easier aboard a Gen-4 TNT 850. As we have mentioned in our reviews of the Gen-4 platform, we are not fond of the new loose foot positioning. 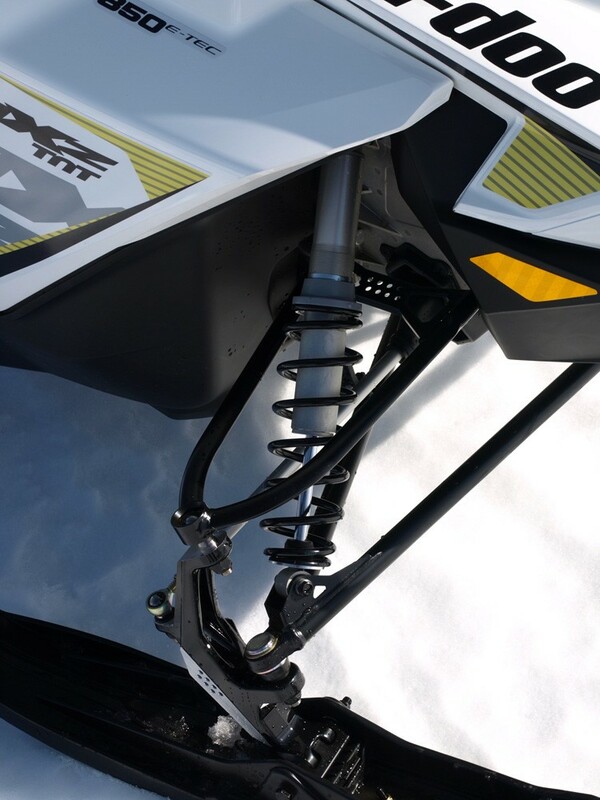 According to Ski-Doo this is a “specialized feature for specialized riding styles.” The MXZ and Renegade feature a flat footrest and trail-specific side panels with open toeholds. Not a favorite with us, but there are options, which we would choose, to overcome our concerns. And, of course, what’s a Ski-Doo without some flourishes? Although its not standard on the TNT 850, the Spring Only MXZ X 850 X-package featured a more precise rack steering system and the Forward Adjustable Riser that adds four positions of fore-aft adjustment and allows you to customize the riding position in seconds without tools. Although standard on the MXZ X and Renegade X packages for 2017, the Forward Adjustable Riser is an available option for the TNT 850. We suggest you consider it, but if you don’t, keep in mind that the primary setting for the adjustable riser mimics the handlebar position of the TNT 850. Whether it’s getting big air or simply setting up for the next mogul, the TNT 850’s RAS 3 and rMotion suspensions offer plenty of cushioning for performance riding. The seating is the same for both the X-package and the in-season TNT 850. We like it. With a generous application of multi-density foam, the seat design suggests an off-road motorcycle saddle, being very narrow at the front to invite movement into a turn, yet with a wide, near-flat rear section perfect for cruising in comfort. 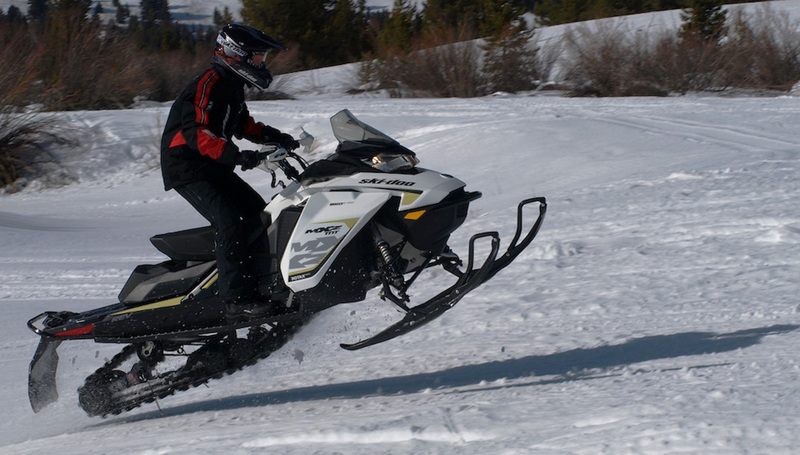 You expect ergonomics to excel on Ski-Doo brand products and the TNT 850 won’t fail you. It is easy to ride with well placed instrumentation, handlebar with hooked ends, push button start and electronic reverse. The sled is smartly styled in either an all black or white with black trim. It has a look that suggests Ski-Doo’s pioneering history while maintaining a strong sense of the now. 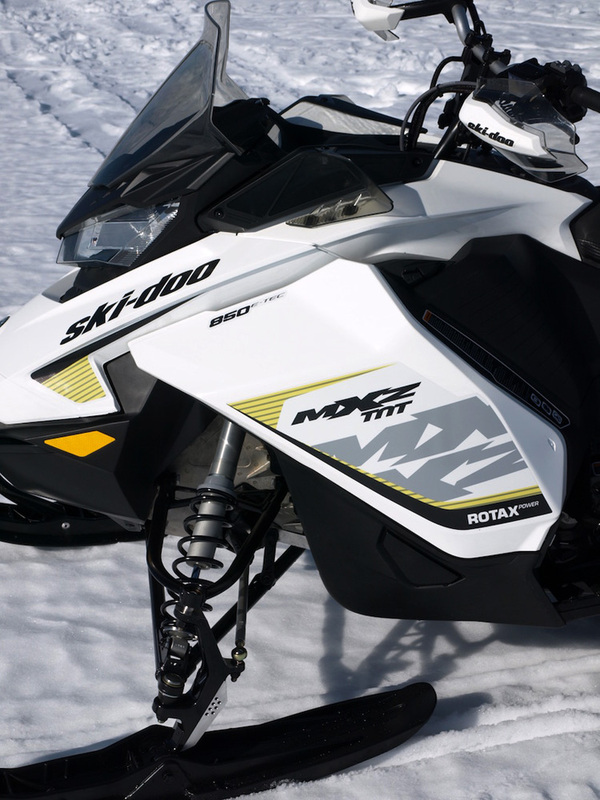 All in all, we fully expect the MXZ TNT 850 to be a strong seller for both performance and casual snowmobilers. The performance rider will enjoy the overall power and mid-range to top end hit that the 850 provides. 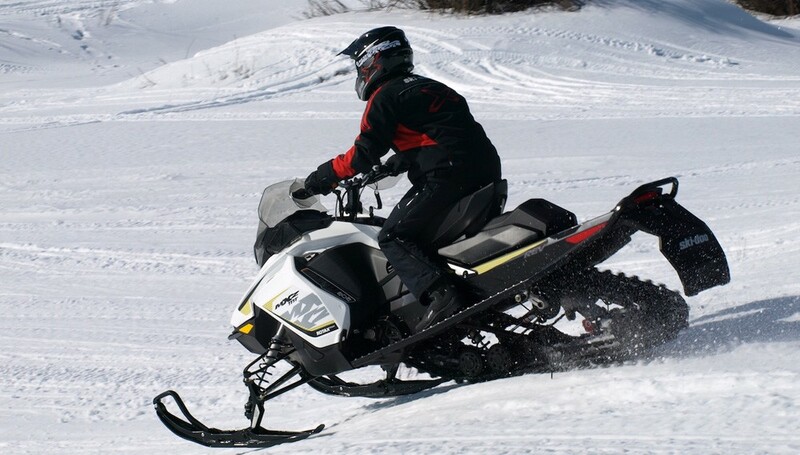 The casual rider will enjoy the crisp look of the sled and its E-TEC attributes such as better than average fuel mileage for an 800 and the excellent oil efficiency that comes from the E-TEC. This new more powerful, larger displacement 850 twin is expected to have oil economy in line with the 800R E-TEC. The only thing that the early season MXZ X 850 offered standard that’d we’d miss on the in-season TNT 850 is that nice-to-have forward adjustable riser bar. But we can get that as an add on. Overall, Ski-Doo’s MXZ TNT 850 E-TEC is a definite winner. We like it a great deal. It has terrific on trail 850cc punch. It’s smartly styled. It has the latest Ski-Doo suspensions with RAS-3 up front and rMotion at the rear for a composed ride and excellent balanced handling. 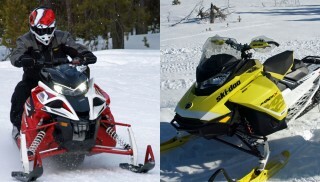 Ski-Doo has done a terrific job with its fourth generation REV and all-new 850 E-TEC twin.